Mbelle , Ammon V.Y. and Razack Lokina. 2016. “Productivity Trends in The Economy” . This is a chapter in the book entitled ' The Economy of Mainland Tanzania Into the 2000s: Productivity, Human Capital, and other Leading Issues'. 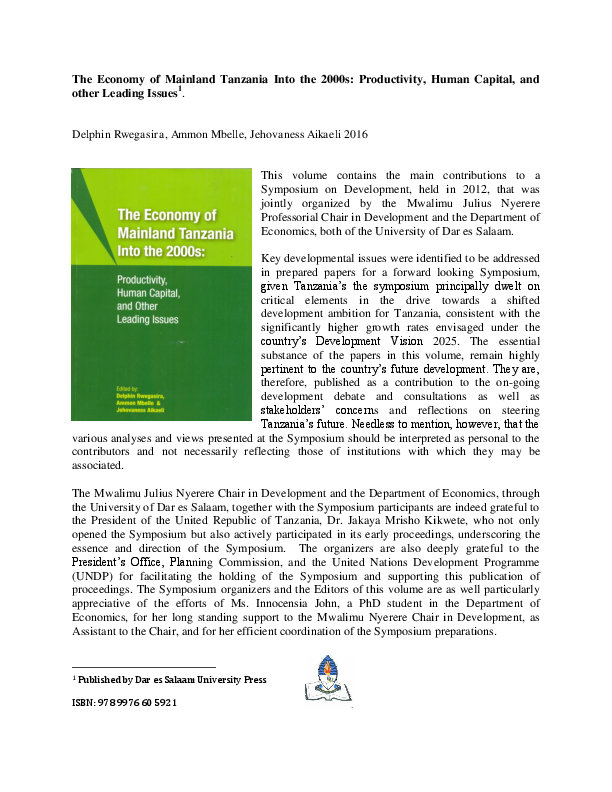 This volume contains the main contributions to a Symposium on Development, held in 2012, that was jointly organized by the Mwalimu Julius Nyerere Professorial Chair in Development and the Department of Economics, both of the University of Dar es Salaam. When President Jakaya Kikwete recently signed Tanzania´s new National Strategy for Growth and Reduction of Poverty, it was a milestone to celebrate for EfD Research Fellow John Kedi Mduma. Since 2007 he has been involved in monitoring and reviewing the national strategy. Now he is in the middle of designing the Implementation Guide for the forward-looking strategy for 2011-2015, known as MKUKUTA II in Kiswahili.